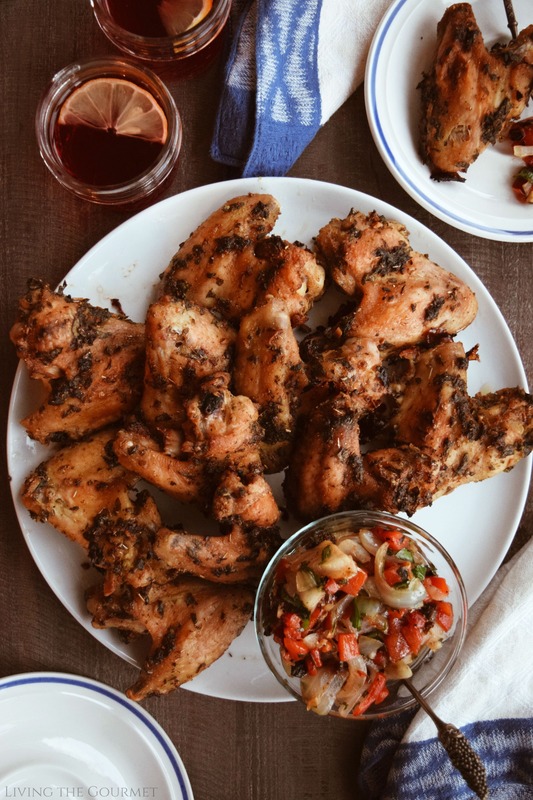 Chicken wings get a major upgrade this season with a Mediterranean marinade and a sweet grilled onion & pepper chutney to serve alongside it. Fast forward to today, and that equation has completely flipped. A whole roasted chicken is ‘old fashioned,’ cutlets are for busy weeknights, and chicken breasts (grilled or otherwise) are often regarded as ‘healthy’ as opposed to ‘delectable.’ By comparison, a tray of wings is a sure sign of a party. 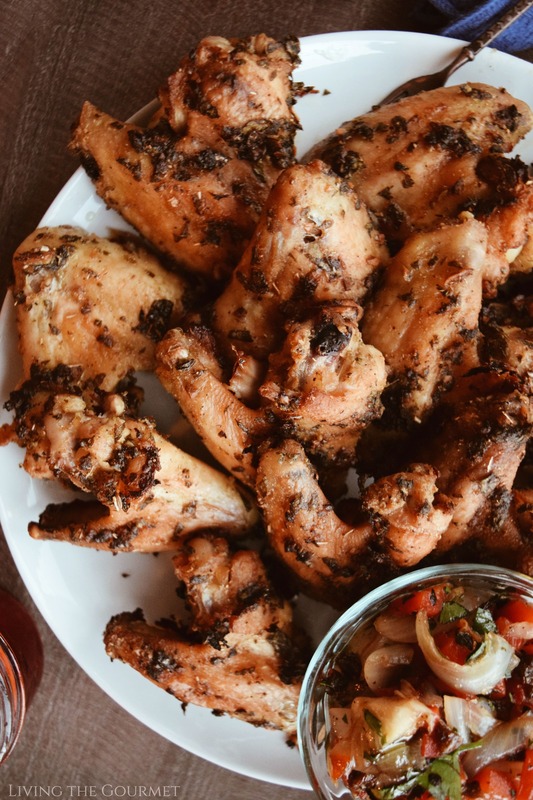 The subject of countless books, shows, and blogs devoted solely to tfhe preparation of ‘Wings,’ it’s safe to say that these former ‘undesirables’ have captured our collective culinary imagination. 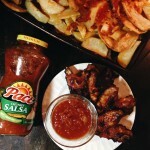 For today’s post, I wanted to prepare a plate of wings, but I wanted to pass on overly thick and spicy sauces and mounds of cheese, while also skipping the deep fryer. Instead, I wanted a more ‘upscale’ plate of wings, one that could serve equally well at a game party as at a dinner party. 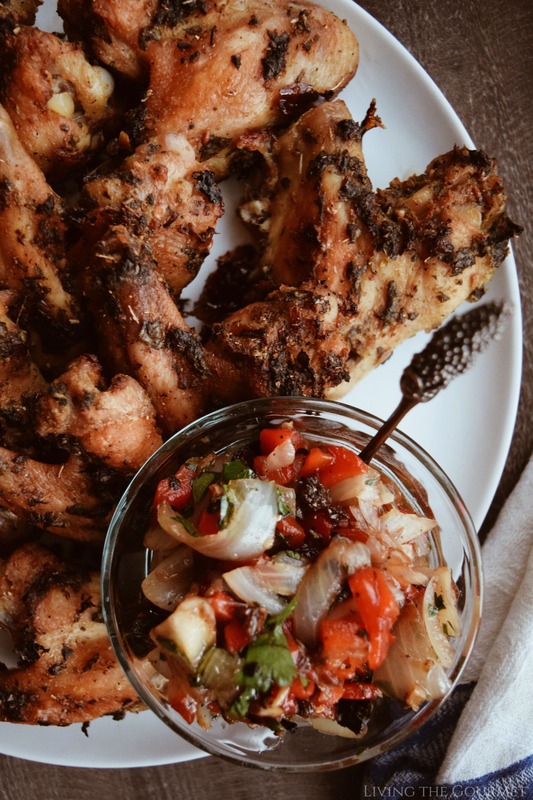 The end result – Mediterranean Style Chicken Wings with a grilled onion and bell pepper chutney. The recipe is surprisingly easy to put together. 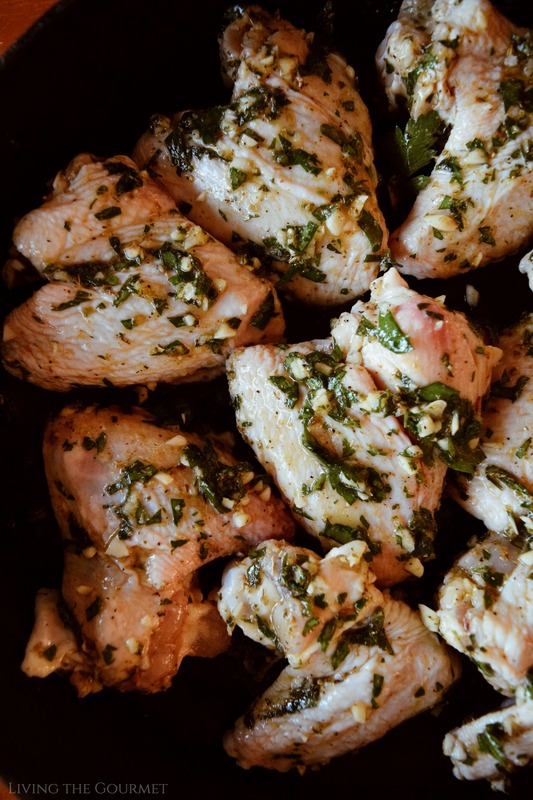 We start off by marinating the wings in mixture of olive oil, fresh lemon juice, Italian parsley – sans the stems – finely chopped garlic, salt, pepper, oregano, coriander, and sugar. We then let the wings marinade in this mixture in the fridge for at least an hour, or, for best results, overnight. We then set the wings in a cast iron pan, and bake in the oven for fifty-five to sixty minutes at three-hundred and fifty degrees Fahrenheit. Note that there shoudn’t be any marinade left over, as this is not a watery marinade. However, if you do, feel free to add that into the pan with the chicken. The chutney is a bit more involved to prepare then the chicken itself. 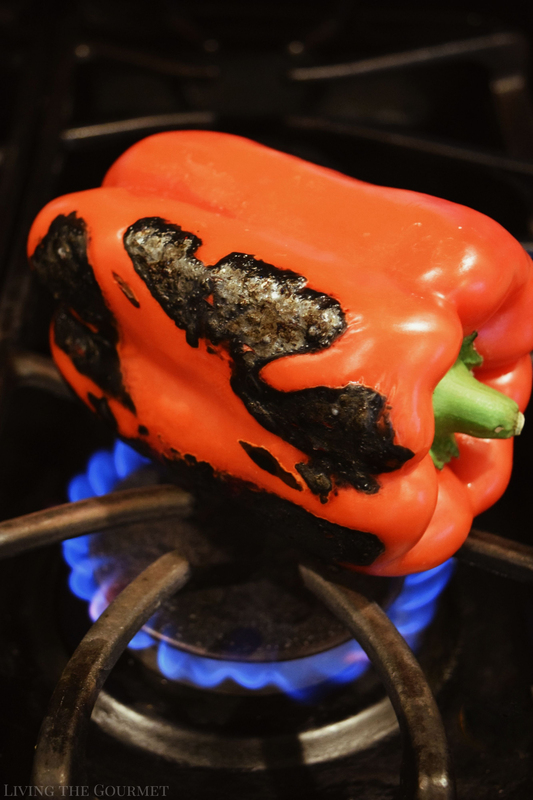 We start off by grilling a red bell pepper either directly on the open flame of your stovetop, or, if you prefer, dry in a cast iron pan. Either way, you want to achieve a nice char as pictured below. After letting the pepper cool, scrape the char off, and then cut the pepper into diced strips as pictured below. Finally, heat a cast iron pan with some olive oil, sliced onion, and chopped garlic, and allow them to achieve a nice golden color. You want the onion to be slightly translucent. Finally, combine the peppers, onions, and garlic in a medium-sized mixing bowl, and add in chopped raisins, fresh lemon juice, honey, the seasonings listed below, along with some olive oil, parsley, and then give that all a nice toss to mix, and serve it alongside the wings. Combine all of the ingredients for the marinade in a large bowl. Add the chicken wings and toss. This may be used immediately or cover and place in the refrigerator for an hour or up to overnight. 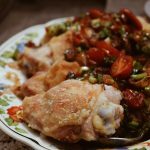 Place chicken wings in a cast iron frying pan and bake for 55 – 60 minutes or until the wings become a beautiful golden color and the juices at the thickest part of the wings runs clear. Grill the red bell pepper on the open grill or in a pan to a nice char. Let the pepper cool and then gently scrap the skin off and cut the pepper into diced pieces. Next, heat a cast iron frying pan with 2 tbs. 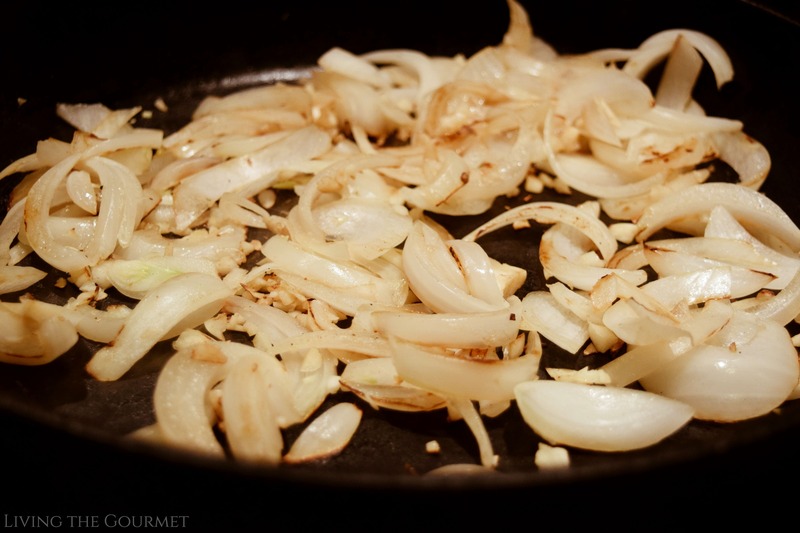 olive oil and place the sliced onion and chopped garlic in the pan to get to a nice golden color, tossing as you saute, so that you do not burn the garlic. Place the diced pepper and the onion and garlic in a medium sized bowl. If you would like the chutney in smaller pieces you may use a scissor and cut through the pieces in the bowl. Add the chopped raisins, lemon juice, honey, seasonings, olive oil and parsley and toss. Serve with the wings. Refrigerate after using. One of the reasons I love this chutney is its versatility. From being easily ‘tweaked’ to making for a great addition to a variety of recipes, this is one item you’ll want to keep in the back of your mind. 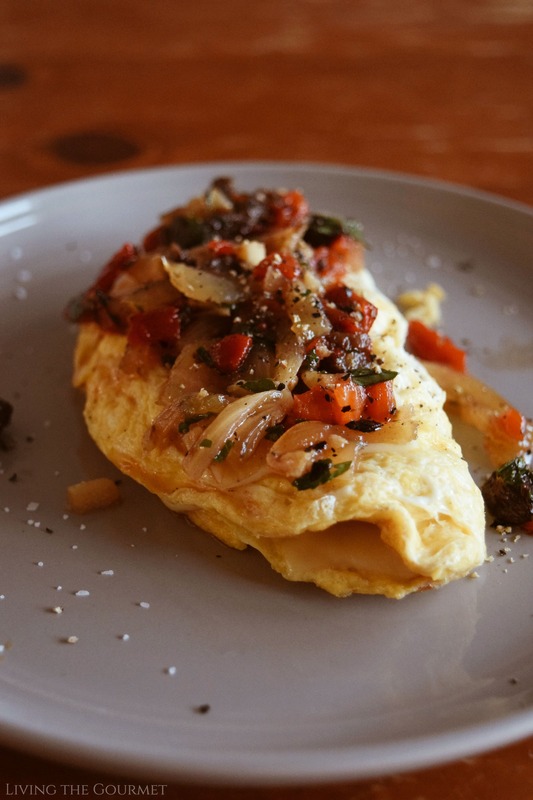 1) Turn a ‘quick and easy’ omelet into a ‘gourmet’ breakfast. As pictured here, simply prep a ‘French style’ style omelet with some cheese, salt and pepper, and then spoon the chutney over the top. Warmed or room temperature for the chutney works equally well in my experience. 2) Sandwich spread. I find this chutney works particularly well on panini or grilled sandwiches to add a bit of complexity. Either spread onto the sandwich during assembly, or used as a dip afterward works great. 3) Steak spread. With some crumbled blu cheese, this chutney would work wonders on your favorite steak with a bit of crumbled blu cheese mixed in. 4) Add some heat. My son prefers this chutney a bit on the spicier side. To achieve this, feel free to add in some red pepper flakes. For even more heat, simply grill up a jalapeno, chop that into the chutney. You can adjust these measurements to fit your heat preference/tolerance. 5) For celery boats, simply add the chutney to a block of cream cheese and give a few chops in a food processor and spread into the celery boats. If you’ve been following along with us, you probably know by now that the Super Bowl is kind of a big deal in our house. We’ve been sharing some of our game day favorites with you and in the spirit of the big game, we’re also hosting a couple of giveaways! You can enter below AND be sure to enter our other giveaway HERE. So now you basically have TWO chances to win a gift card this season 😀 Both giveaways will end 2/8 so be sure to enter daily. Best of luck and have fun! They look fingerlickingly delicious! 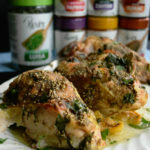 Love the herby marinade. Thank you Dave. Have a great day! I love this healthy take on an appetizer classic. I can't wait to try these! We are chicken wing lovers here. Homemade beats anything you can get at the grocery store. I know these would be HUGE hit, and I would have to make a double batch for sure. Thank you Aleta. I hope you and your husband enjoy them. I love all things Mediterranean! (And roasted pepper!). YUM. Me too! Thank you for visiting. 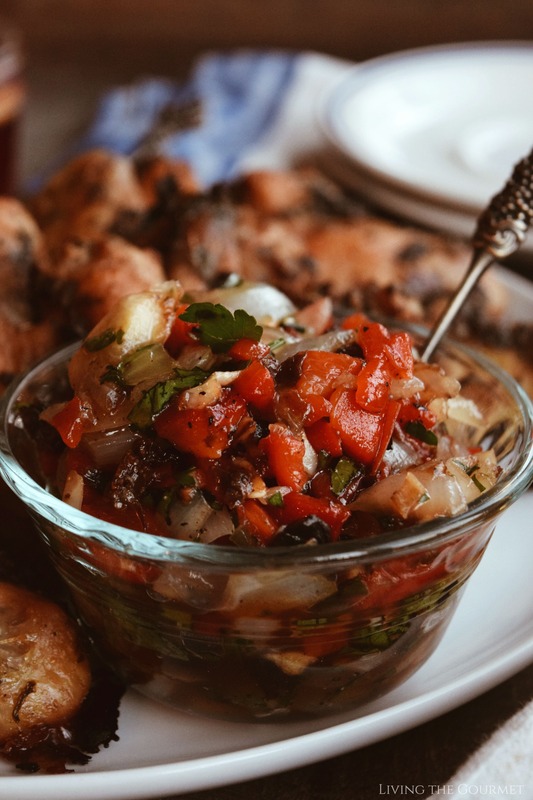 I love chicken wings so much, and I bet that onion and pepper chutney is utterly delicious - can't wait to try! This sounds like such a delicious meal that my whole family would enjoy. Love Mediterranean flavours! I'm a huge chicken wing fan and these wings look outstanding! I also love chutney and it looks so delicious! Anything with chicken makes my favourite dish pick. The chicken wings looks so delicious, wow! I can't wait to try this out at home. That marinade sounds fantastic! I the chutney would pair well with so many other options. Can't wait to make this. Thank you and I hope you enjoy it if you give it a try. Everything on here are amazing especially those wings,just by looking at them I’m hungry! Fantastic recipe. This is something my family would definitely eat. I will have to check it out. Thank you, I hope you enjoy it if you give it a try. This looks tasty and beautiful! I can't wait to try it! This looks tasty! I can't wait to try it! Thank you, I hope you enjoy it if you give the recipe a try. I need to try this recipe out stat! Those look so delicious! Thank you. Hope you enjoy it if you decide to give it a try. 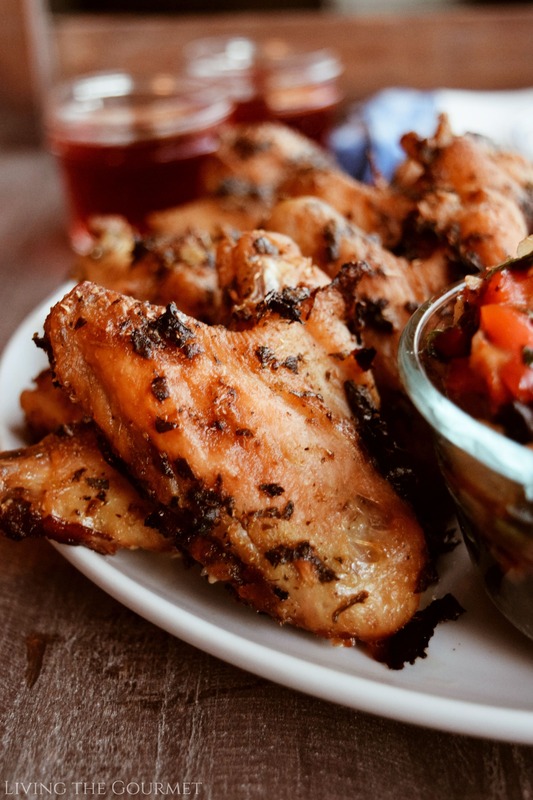 I don't usually think of chicken wings of upscale, but this recipe definitely upgrades them. What a great giveaway! One of my favorite dish is actually my Spicy Teriyaki Chicken Wings. This recipe that you shared sounds really tasty and delicious. Thank you so much! This menu is something that I can enjoy since my diet is chicken and fish. I like the fact that you grilled the pepper on the stove top, didn’t know we could. I will be trying this myself!! 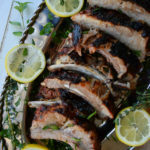 This is a gorgeous recipe! 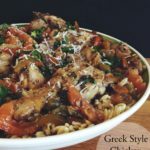 I love chicken wings, and Mediterranean style too. Lovely, so tempting and to make for my parents. I am sure they will love this for sure. Thank you, I hope they do. This grilled chicken looks the best and I looks so well seasoned. I love anything with onions. Thank you. I hope you enjoy it, if you do. I am so trying this for my kids. These look so crispy and that side is droolsome. I LOVE LOVE LOVE grilled red bell peppers! I can't believe I have never made chutney with them! This recipe is super inspiring! Cannot wait to try! We really enjoy chicken wings. Yes, they are very flavorful and it doesn't matter if they're fried, grilled, or baked. They taste terrific any way we can get them. They used to be so cheap at the grocery store but now everyone wants to buy them. So it's a matter of supply and demand. The wings are the most expensive part of the chicken. Your wings look so tasty with the Mediterranean flavors. The chutney is such a great accompaniment to the wings. These look great for game day parties and backyard summer BBQs too! I love the chutney accompaniment as well! Oh my gosh that Chutney sounds amazing! Well and obviously the chicken wings too. Yum, these are winning! Those are some nice looking chicken wings. 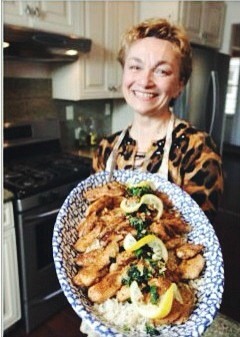 Thanks for sharing the recipe :). I love roasted red peppers so this recipe sounds like it would be right up my alley! We'll definitely have to give this a try the next time we have chicken wings. We love all the things Mediterranean, such a flavourful and delicious, roasted red peppers brings that extra flavours.